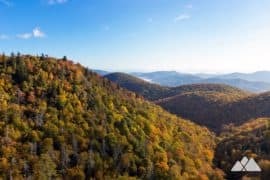 Linville Gorge is strikingly beautiful. 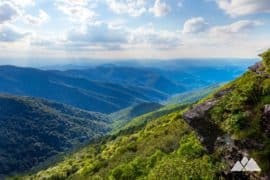 Carving deep into the mountainous landscape between Asheville and Boone, a tumbling river dives deep between two rugged ridges, flowing nearly 2,000 feet below the surrounding mountain summits. 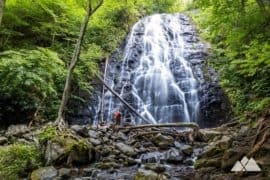 At the gorge’s northern edge, near the Blue Ridge Parkway, the river cascades in a series of waterfalls that plummet through its dramatically beautiful landscape. 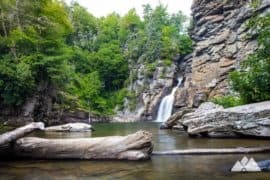 Linville Falls thunders through a towering cliff before pooling in a deep, wide basin below the waterfall and flowing downriver through the 12-mile gorge. 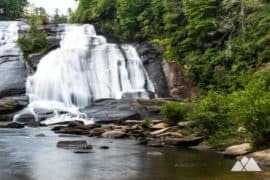 It’s a spectacular series of waterfalls – and this moderate, two-mile hike scores stunning views of the falls from many excellent vantage points. 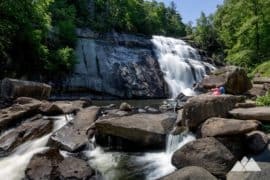 This hike visits three waterfall overlooks on a one-mile outbound adventure, each catching a unique perspective of the upper falls, immense lower falls, and the surrounding gorge. And a bonus overlook, near the hike’s end, offers southbound views into the deep-carved gorge. 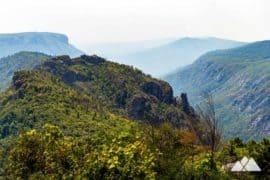 It’s a hike that’s particularly gorgeous in summertime mornings, as the fog begins to lift from the gorge’s deep valley and the sun rises over the opposite ridge. 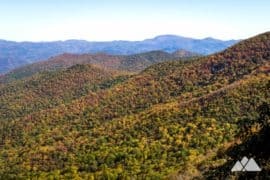 The hike begins at a visitor center located just off the Blue Ridge Parkway near MP 316 (view maps and driving directions). The trail crosses a bridge over the Linville River, following a wide gravel road and rolling elevation through a vibrant green forest. Tall trees tower over the rolling landscape of grasses, rhododendron, and fern. 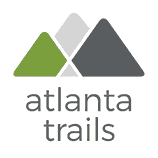 The hike hangs a left at .5 miles, following signs to the upper falls overlook. 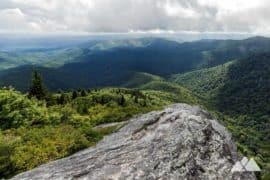 The hike descends through a blocky, cliff-lined terrain to the overlook’s wide, smooth rock expanses on the river’s banks. 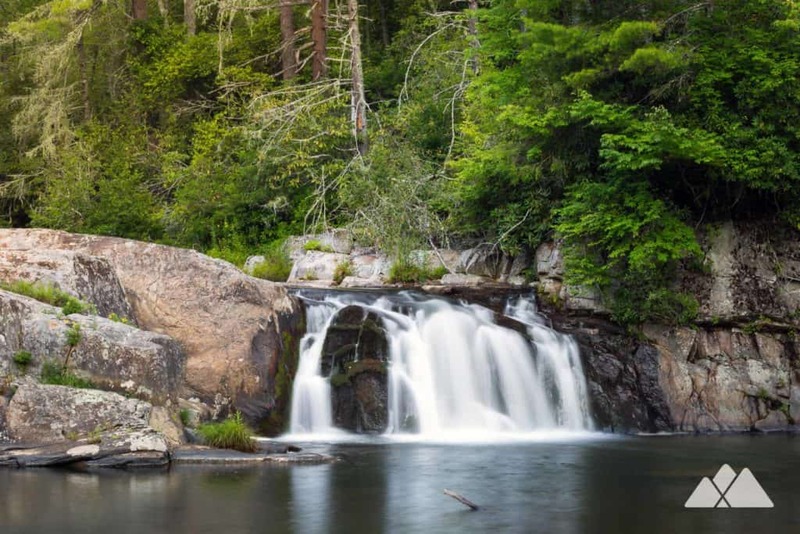 Upriver, the upper waterfall cascades down in a pair of synchronous waterfalls framed by 20-foot-tall outcrops. 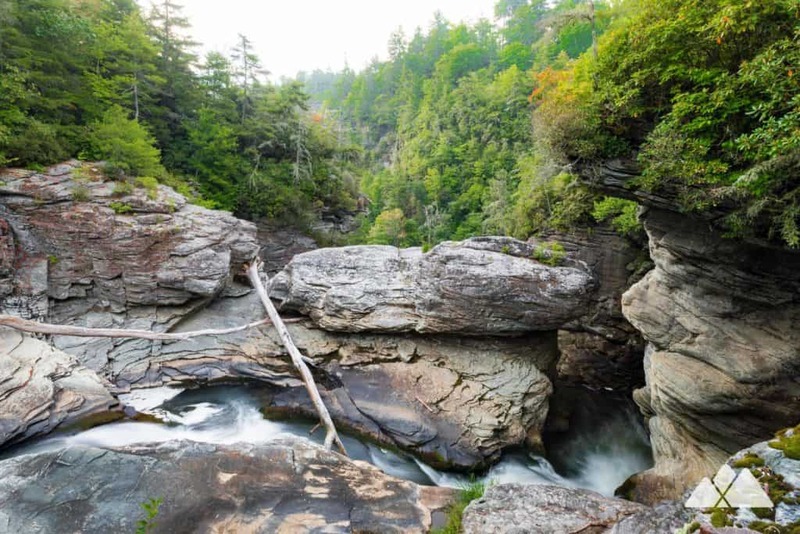 Near the overlook’s southern edge, downriver from the upper falls, the river carves deep into a canyon, surging and twisting in tendrils of whitewater before plunging through a cliff. The lower waterfall is just out of sight – but the tremendous roar of water gives an audible preview of its beauty. 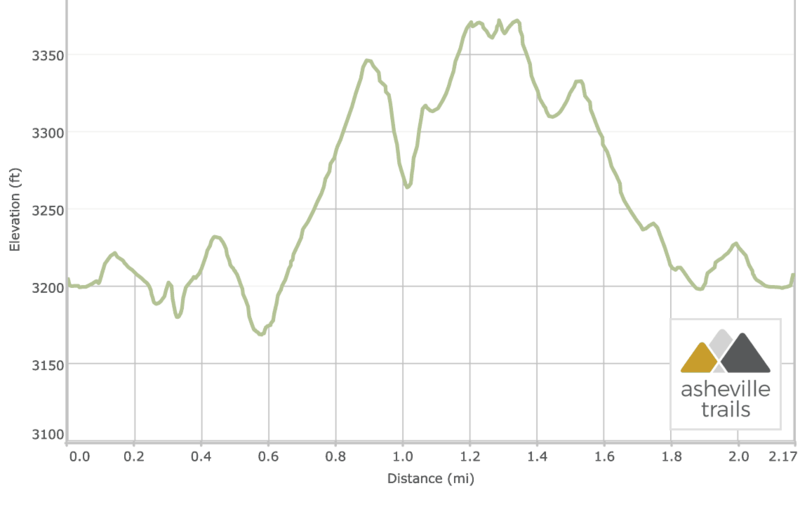 The hike turns, retracing its steps back to the main trail and climbing elevation. 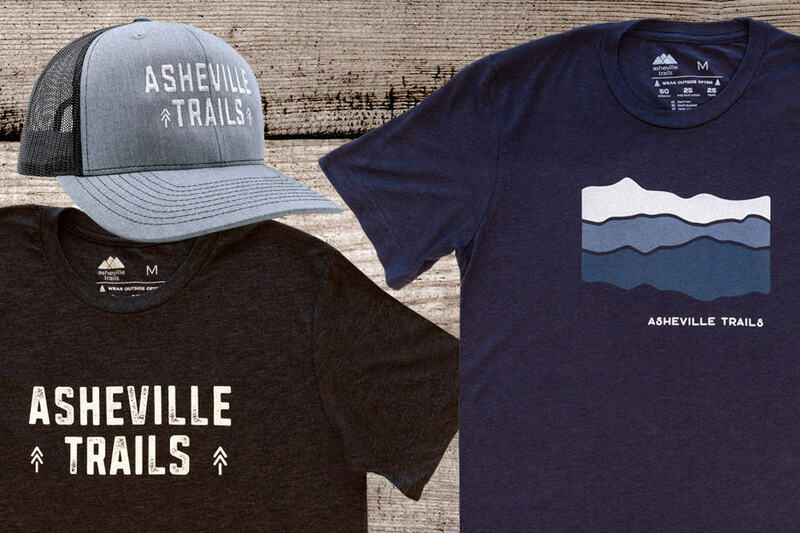 The trail arcs away from the river, ascending through an old-growth forest of broad-trunked pine and hemlock. 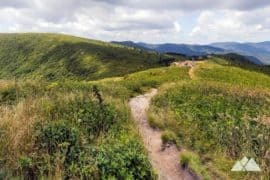 The hike reaches a spur trail at just under one mile, turning left to catch views of the waterfall from the Chimney View overlook. 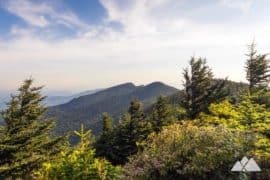 Chimney View’s high-elevation perch offers stunning views into the gorge below, catching sight of the enormous falls dropping through two tiers in a towering, blocky cliff. 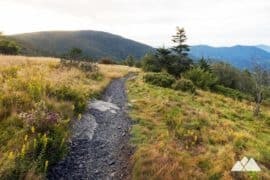 The hike retraces back to the main trail once again, turning left to hike to Erwin’s View overlook. 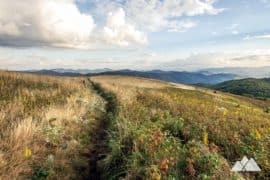 Reaching the trail’s end, two short spurs travel to the trail’s final overlooks, and the hike veers to the right, catching stunning views into the gorge. 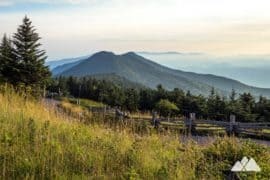 The hike doubles back to the split, veering right to trek a short downhill to Erwin’s View. 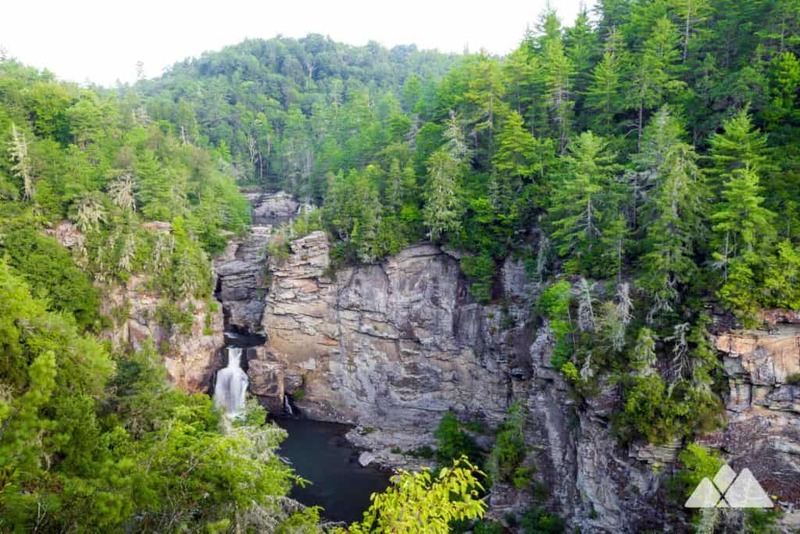 The overlook offers beautiful long-range views of Linville Falls as it cascades down between the gorge’s grand walls. 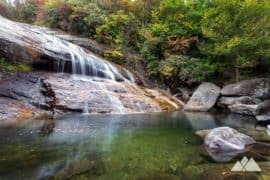 Downriver, the river courses through a boulder-filled bed, carving in a wide meander through the deep-channeled mountain landscape. 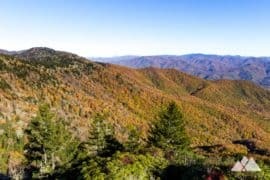 Departing Erwin’s View, the hike retraces its steps to the trailhead, completing the hike at just over 2 miles. 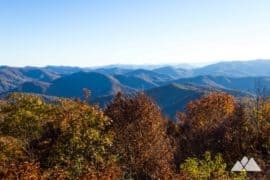 In the area with extra energy, time and daylight to burn? The Plunge Basin Trail departs from the visitor center, descending to the gorge floor for an up-close view of the falls across a deep, glassy basin. Looking for some exceptional views? 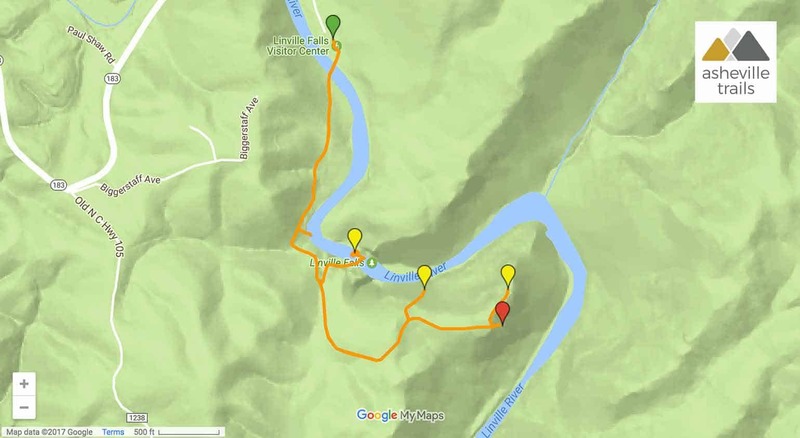 Head to the gorge’s eastern rim to hike the Table Rock Trail. 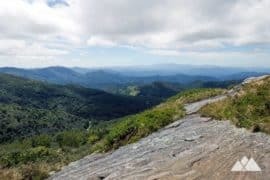 Table Rock’s plateaued mountain summit offers stunning, 360-degree panoramas on a moderate 2-mile trail. 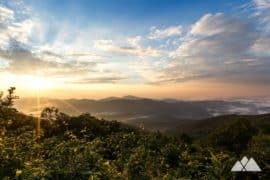 Catch some gorgeous sunrises and sunsets on the Hawksbill Mountain Trail, climbing to the summit of a rocky, jagged, beak-like mountain. 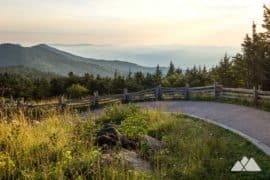 Hike the gorge’s southern end near Lake James on the Shortoff Mountain Trail, and catch incredible view after incredible view on this 7-mile roundtrip. 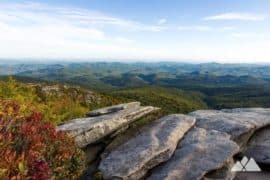 Or for more of our favorite hikes and campsites in the gorge, check out our Linville Gorge hiking and camping guide for more adventure inspiration. 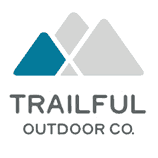 Up for chasing some more ultra-stunning cascades without a long hike? 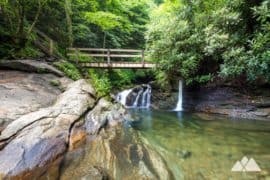 Our favorite hikes to waterfalls near Asheville under two miles explore some of Western NC’s most beautiful falls on great beginner-friendly trails.